Next to the former Working Mens Club in what is now part of Foot Lane, there used to stand 6 cottages that formed Red Row. The six cottages are shown on the 1891 Duchy Estate sale plans with yards leading down to the brook. The gardens were at the front of the houses (they got more sunshine there) between the houses and the road and they were fenced off with a picket fence. The land at the rear was just a backyard that lead down to the barns and toilets. There were three barns at one end, then six toilets were side by side and a further three barns at the other end. Some of the barns were used as cobblers shops where shoes were made. The toilets were actually flush toilets although no water was connected, it just meant pouring a bucket of water down them. 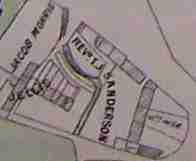 In the 1800s the properties were owned by William Jellis (blacksmith) and were known as Jellis Row up until the 1920s, when the name Red Row appears. In the 1970s the properties were owned by Raunds Properties Ltd, but in January 1978 were condemned by East Northants Council as unfit for habitation, resulting in them being declared a Slum Clearance Area under s42 Housing Act 1957. This allowed ENC to purchase the properties for demolition. The District Valuer recommended the sum of £5,600 (plus fees) and this was agreed by ENC in June 1978. Notice of the Compulsory Purchase Order for Red Row, Chelveston, for slum clearance in 1978. The Parish Council registered an interest in acquiring the cleared land (as ENC had no use for it), but later withdrew. Six firms tendered for the demolition works, which was won by D&L Plant Hire Ltd of Brook St, Raunds for £200 in September 1978. The District Valuer recommended the cleared land (approx 994.2 sq yards) with outline planning permission be valued at £8,200 and ENC agreed to this in January 1979. It was sold to a local developer, Allen House Developments Ltd, and subsequent to this, the two present day bungalows were built. Percy & Lucy Felce with daughters Marion & Irene. Walt & Olive Bridge with Bobby, Gill & Jenny. Walt & Rose Conquest with Gladys, Freda & Dennis. Violet Smith with George, Pauline & Kenny. No.3 Mrs K.Garley—moved out in September 1976 to ENC housing in Rushden.